Aysel is a physics nerd. Roman is a basketball star. What they have in common is they both want to die and seek out a suicide partner online. Aysel’s character is what you would picture of a suicidal teen. Her depression forces her to see the worst; her mother’s frown is because of Aysel, people talk behind her back waiting for her to turn into her father, her half-sister living as if Aysel didn’t exist. As she starts to regain hope you slowly start to see behind the veil of her depression that maybe the world doesn’t hate her as much as she thought. Roman’s character is different. He is a former basketball star and shows no outward sign of being depressed until Aysel looks closer and sees herself in him. His depression comes in the form of guilt over an accident that happen almost a year before the story takes place, in which he is sure is his fault. 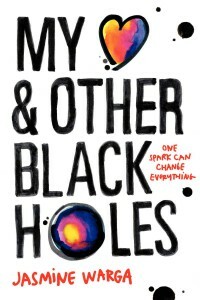 My physics-nerd half is a little disappointed that Aysel, being a physics-nerd herself, didn’t mention the titled “Black Holes” as much as I would have liked. There was plenty of talk of kinetic and potential energies, but only once (maybe a couple of times) when a black hole was mentioned as a comparison to depression. 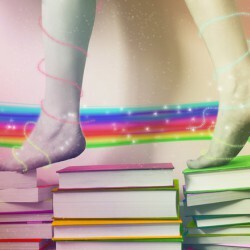 The individual emotions of the two main characters is what makes this book stand out. One character trying to find a connection and another trying to disconnect; both feeling different emotions and having different reasonings but coming to the same conclusion. It’s a slap in the face to Aysel (as well as the reader) that anyone can be suffering from depression no matter how well put together they seem on the surface. I would have liked more interactions with minor characters. I’m a sucker for good minor characters and there was so much potential in Aysel’s half-sister and Roman’s former friends to be good minor characters. Overall, I would recommend My Heart and Other Black Holes to anyone who likes realistic fiction with light romance and heavy on the psychological side. Definitely an author to keep an eye on.